Running at wide-open throttle at 50mph into a F3 posed no problems whatsoever. I never got a chance to get her fully airborne, but without a doubt the 525 is well put together. The most important aspect of this boat is the social appeal. Greeted with ‘if James Bond had a boat, it would probably be this’, my imagination was stirred. Clearly the Wave Boat 525 had made an impression on Graeme, our photographer, while I had been slogging through traffic jams. I could see his point as we slipped out of Christchurch watched by curious holidaymakers. Call it what you like, this is an unusual boat – the marriage of a PWC and the fore section of a bowrider. Built in France and imported into the UK by Wave Boat UK of Christchurch, the Wave Boat is available in various models and sizes. You can order or retrofit a selection of 14 different jet skis to it – or should I say in it. The idea is very simple: you drive your PWC into the stern of the Wave Boat. It then slots into custom-built nylon rails, known as the ‘compatibility kit’, made for your specific jet ski. Once in, you buckle up with a heavy-duty strap system mounted on each quarter, stopping the PWC from sliding back. It is quick and simple, and the big nylon rails do a good job of holding everything tightly in place. If you change your jet ski at a later date you simply buy a different compatibility kit. It gives the PWC concept a totally different slant. For example, the Wave Boat is a Cat C craft, certified for inshore waters with up to F6 winds and a 2m swell. What sort of pace you could maintain in such conditions is another matter, but it would certainly get you home a lot safer than a jet ski would in such weather. Also, the Wave Boat can venture into inland waters and other areas where PWCs are banned. The most important aspect of this boat is the social appeal. Let’s face it, jet skis are not social machines, and anybody sitting on the back of one is certainly not having the same fun as the driver. Fit the Wave Boat and things change, as now the whole family can go out for a cruise. Significantly, with an 11in draught you can easily slip onto some abandoned beach without people having to wade ashore up to their waist. Alternatively you can drop the hook, leaving your crewmembers to enjoy their surroundings while you unbuckle, and then blast off for some manic fun. The boat has a boarding ladder on its port quarter, or swimmers can clamber aboard through the empty PWC dock. Of course, with its rapid performance and tight turning ability, it is a great wakeboarding/ski boat. The 525 is fitted with three deck storage lockers, all neatly lined, plus a large lined anchor locker. Its social side is enhanced by a drop-down table, providing either an eating area or a large sun pad, and the twin aft-facing sunloungers sitting aside the PWC dock work particularly well. This arrangement enables your guests to chill out and communicate easily with you, without getting doses of seawater when you start piling on the power. They are also pretty secure high-speed lounging locations as I subsequently found out. The craft has navigation lights, and a sound system located under the port-side aft sunlounger, both powered by a battery in the central forward self-draining locker. However, this does not have any method of charging, for which I would advise a small solar panel is fitted. The foredeck area is also self-draining, so there is no need for a bilge pump. The Full Wake version of the Wave Boat 525, as tested, comes with the Monster Tower wake tower, complete with board rack and bimini top – crucial pieces of kit considering its wake boat potential. 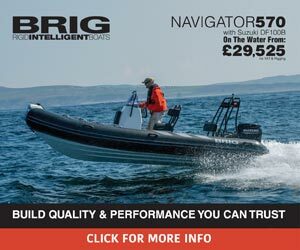 For those who want something bigger with more offshore potential, there are two bigger RIB Wave Boats imminent. These will be shown at SIBS, and are likely to be featured in PBR in the near future. It goes without saying that driving the Wave Boat 525 Full Wake is a very different experience to the average 17ft sports boat. Unlike the jet ski that propels it, it heels very slightly in the turns due to its wide beam and relatively shallow forward deadrise angle. It is like driving a quad bike, and even has the same lever throttle set-up on the starboard handlebar. Our test boat, having a punchy top-of-the-range Yamaha FX SVHO sitting inside it, was a quick boat. The Yamaha also has a jet drive with a trim function, which I was told is a feature exclusive to Yamaha jet skis, enabling its driver to squeeze some extra speed as conditions permit. Giving it wide-open throttle into the fairly moderate sea conditions of the day, the healthy power-to-weight ratio was evident. She takes off in a brace of shakes, and if you feel you are overdoing it, then releasing the sprung throttle quickly drops the speed. In this department, this boat is pretty safe for a novice to drive, especially as you can’t drive it in a ‘sporting manner’ without your hand on the power. I say this because the Yamaha FX SVHO has a cruise control setting, and a ‘no wake feature’ enabling you to set it to a slow constant speed for slipping into harbour. Once you get accustomed to its quick response, the 525 is great fun to throw about into full-lock full-power turns – to a point that you will not want to hold a straight course for too long. As well as towing wakeboards and skiers, this craft is about having fun, which it is clearly good at. One thing I was interested to find out was just how a two-piece boat handled being driven fast into a seaway, albeit a fairly moderate one. Running at wide-open throttle at 50mph into a F3 posed no problems whatsoever. I never got a chance to get her fully airborne, but without a doubt the 525 is well put together. She handled the sea without complaint, helped by the fact that she has good natural fore and aft trim, consequently keeping what little forefoot she has into the oncoming waves. However, in such conditions she is a wet boat – to such an extent I was half expecting my life jacket to auto-inflate. If you are going to drive her hard into some chop, it would be best to wear a crew saver, or slow down. This boat will succeed on two fronts: firstly as a complete concept supplied with a jet ski, and secondly as a retro purchase to mate to an existing PWC. On the first count, based on my experience of having owned many Yamaha outboards and motorcycles over the years, as well as rival brands, I would opt for the Yamaha FX SVHO as featured in this article, but this is, of course, a matter of personal preference. Whatever PWC you choose to use, it needs to have adequate power to drive a 17ft family boat at the speeds you want to travel at. The FX SVHO is normally a 70mph machine, but when plugged into the 525 it loses 20mph. Add a family and a day’s provisions and things will slow down a little further. In the second case you can, with the relevant kit, fit this to your existing jet ski, which then gives what might have become an unpopular big boy’s toy a family dimension – something not to be underrated.